Everyone knows how a bathtub works, right? If water flows into the tub faster than it flows out, what happens to the amount of water in the tub? If you said the water level rises, you’re right. And if the water flows out of the tub faster than it flows in, what happens? (Right again. The water level lowers). Now you know how to think like a bathtub. If you’re thinking that the atmosphere accumulates carbon dioxide and other greenhouse gases the way a bathtub accumulates water, you are right once more. Most climatologists agree that humans are putting greenhouse gases into the atmosphere at almost twice the rate that natural processes (such as oceans and other carbon sinks) can remove them. 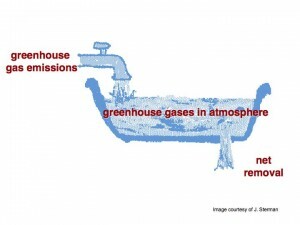 For a fuller explanation of these bathtub dynamics, see Revkin’s blog, Dot Earth, or the Sterman & Booth Sweeney article, “Cloudy Skies: Assessing Public Understanding of Global Warming. (By the way, if you don’t know the work of MIT professor John Sterman, you should! If you watch the video of Sterman on the Revkin post, go to minute 18 for the best part). Here’s the rub: how well do we understand accumulations and flows, also known as stocks and flows? Not well according to some research studies. This isn’t surprising really. If you think about it, where did you learn to think about stocks and flows? You may not have learned about stocks and flows in school, but anyone who has taken a bath, has opened a bank account or has clutter in their home, intuitively understands stock-flow structures. You can imagine your bank account balance as a kind of bathtub—the money in it just keeps getting higher and higher (as long as you don’t make any withdrawals, of course!). So, the balance is something that accumulates. On the other hand, the paying of interest on the account is more like a faucet that flows faster the higher your balance gets. Systems dynamicists would describe your account balance as a stock and your interest payments as a flow. Each of them influences the other. Essentially, an amount of something—trees, fish, people, goods, clutter—is a stock. The rate at which a stock changes, going up or down, is its flow. At this point, you may be muttering to yourself, SO WHAT?! Why do I need to know about stocks and flows? Stocks and flows create many of the most perplexing dynamics we encounter because stocks tend to accumulate, and we often don’t see that accumulation. Studies of the pesticide DDT, for example, have shown while DDT evaporates from the surface of plants and buildings over six months, it remains in the tissue of fish for up to 50 years. The amount of DDT in fish tissue is a stock with very slow outflow. When we understand stocks and flows, we understand that a deficit (the rate at which a country borrows money) is a flow and the national debt is a stock. We understand, as well, that taking the national deficit down to zero doesn’t mean we get rid of the debt. We also understand that proposals to “slow the rate of growth of carbon dioxide emissions” will continue to increase the stock of carbon dioxide and other greenhouse gases in the atmosphere, if the rate at which carbon dioxide flowing into the atmosphere continues to be greater than the rate at which it is draining out.